Not to be confused with Mitchell Henry (American football). "Home Rule". 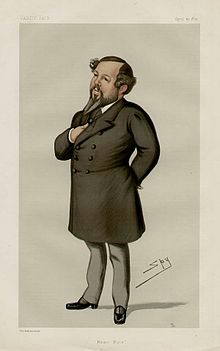 Caricature by Spy published in Vanity Fair in 1879. Mitchell Henry (1826 – 22 November 1910) was an English financier, politician and Member of Parliament (MP) in the House of Commons of the United Kingdom of Great Britain and Ireland. He was MP for Galway County from 1871 to 1885, and for Glasgow Blackfriars and Hutchesontown from 1885 to 1886. Mitchell Henry was the second son of Alexander Henry (1784–1862) of Woodlands, near Manchester, England, a very affluent cotton merchant, founder of A & S Henry & Co Ltd and Member of Parliament for South Lancashire from 1847 to 1852, who was married to Elizabeth, daughter of George Brush of Willowbrook, Killinchy, County Down, and a supporter of the Anti-Corn Law League. He was educated in London and at University College London where he read for a degree in medicine, eventually becoming a Fellow of the Royal College of Surgeons. He became a senior consultant at the Middlesex Hospital in London by the time he was 30. After the death of his father in 1862 Mitchell Henry abandoned his career in medicine and returned to his native Manchester to run the family business. He soon became involved in politics and contested Woodstock for the Liberals in 1865, and stood in the 1867 Manchester by-election, and the 1868 general election, as a moderate Liberal, but was well-beaten in both contests. As part of his candidature in 1868 Henry started up the Manchester Evening News, though it passed out of his hands at the end of the election. He was particularly interested in the cause for a better health provision for the poor. In 1852, he married Margaret Vaughan (d. 1875) of Quilly House, County Down. He built Kylemore Castle in Connemara Co. Galway between 1863 and 1868. He had nine children, five daughters and four sons. The youngest son Lorenzo Mitchell-Henry became an international pigeon shot and invented the Henrite shot-gun cartridge. He later became a record setting tunny fisherman. In 1875 his wife Margaret died, aged 45, of a fever contracted in Egypt. After this Mitchell did not spend so much time at Kylemore, although he kept it going. However, he built a beautiful memorial church a short distance from the house on the shore of the lake. Margaret was finally laid to rest nearby in a mausoleum, where in due course he joined her. The church is a miniature replica of a gothic cathedral, the inside features coloured marbles from each of the 4 provinces of Ireland. In an 1871 by-election he was returned MP for Galway County, and supported Home Rule for Ireland. Having broken with the Irish Parliamentary Party in 1884, in 1885 he was elected Liberal MP for the Blackfriars Division of Glasgow, but defeat the following year when standing as a Liberal Unionist spelt the end of his parliamentary career. He died in November 1910 at his home in Leamington in Warwickshire. Kathleen Villiers-Tuthill: "History of Kylemore Castle and Abbey", Kylemore Abbey Publications (30 Sep 2002), ISBN 0-9542310-1-5; ISBN 978-0-9542310-1-9. This page was last edited on 21 May 2018, at 23:13 (UTC).